The Lake Charles Coca-Cola Bottling Co. just established their ninth scholarship through the McNeese Foundation, donating $15,000 to McNeese State University. 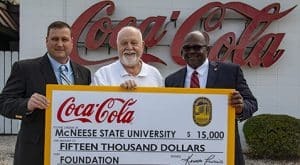 The McNeese State University Foundation was instituted in 1965 to support student scholarships through endowments, and Coca-Cola UNITED has been active in helping them affect students’ lives for the better. Established in 1907, the Lake Charles Coca-Cola Bottling Co. in Louisiana has always been invested in its community, and has a long relationship with the McNeese Foundation. The foundation was created with the purpose of identifying, cultivating, soliciting and stewarding private gifts, and seeks outside resources to support the successful education of undergraduate students. It also aims to provide operational assistance to serve faculty, staff, donors, employers, community members and other constituents. Coca-Cola UNITED focuses its philanthropy in key strategic areas, being education and youth development, enhancement of the environment and the empowerment of individuals and well-being of local communities. Coke has always been dedicated to the growth and success of its communities, especially its youth. The McNeese Foundation and Coke have a long history, and through them students are being supported and encouraged toward bright futures. It’s more than business, it’s community investment.